More than 200 youth, parents, and community members attended Digital Harbor Foundation’s 5th Anniversary Showcase, one of our highest attended showcases to date. 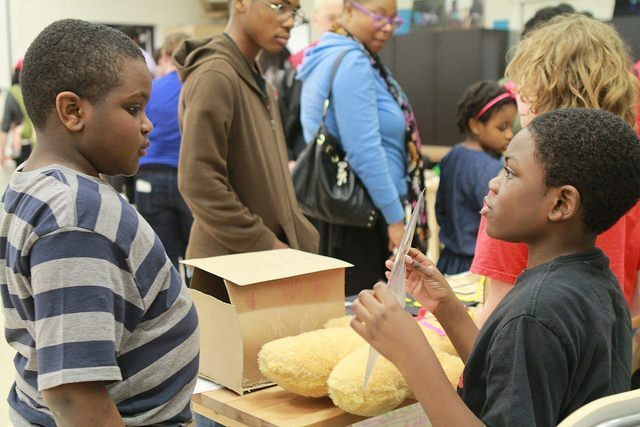 Youth presented projects such as a flashlight made out of recycled materials, an Arduino programmed lamp, and an Arduino-powered cardboard gauntlet. Sam Mitchell, Sorensen Wynn, and Eli Edmondson used Python programming to create a multiplayer game in Minecraft. The object of the game is to destroy bricks under another player in order to increase your own score. “I walked away for a couple minutes and when I came back, everyone was playing it!” said Sam. Jordan Bocklage programmed a headband with wipers for her glasses, a project she had been wanting to make for the past two years since she took the Maker Foundations course. Right before the showcase, she couldn’t find the code to make the wipers move in unison and had to problem solve an alternative way to achieve her desired effect. After she showcased her work, Jordan told her parents and staff that this was only one version of her final work and that more prototypes were to come. 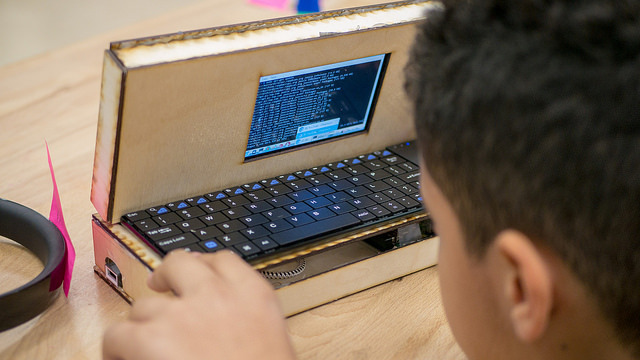 Mayen Nelson used his knowledge of circuitry and digital fabrication he learned in Maker Foundations to create a working laptop using a Raspberry Pi. Mayen worked down to the wire perfecting measurements for his laptop’s frame and finding a screen that worked the way he intended. In addition to being a showcase of our youth’s hard work, this showcase was also an opportunity to reflect on the past five years since DHF had the opportunity to reopen an unused recreation center. “We came to work every day to a mostly empty space,” said Director of Programs, Steph Grimes. 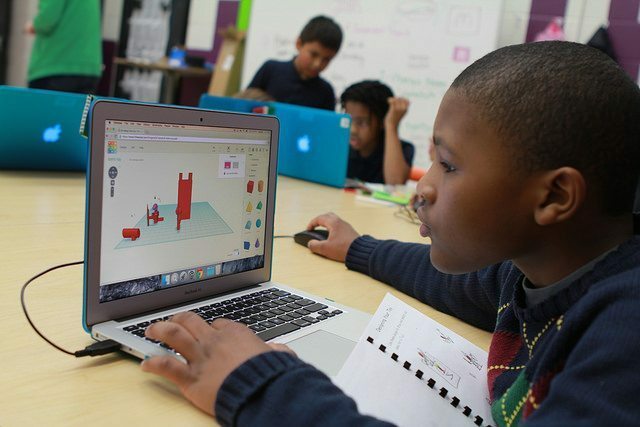 Since then, DHF has expanded to offer courses in digital fabrication and programming to youth from 90 schools in and around Baltimore as well job opportunities and college credit. Several youth have presented projects at the White House and, last year, a DHF project inspired Adam Savage’s SXSL installation. 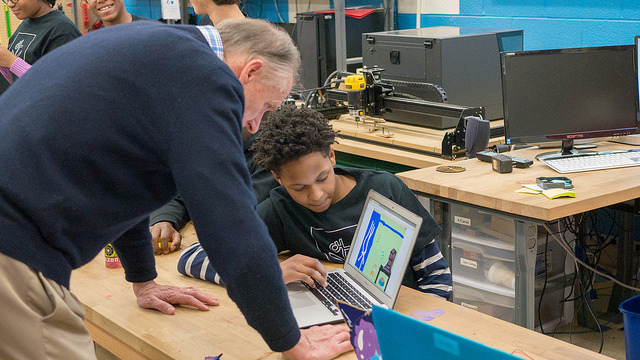 Youth have also championed initiative such as Makerettes, the 3D Print Shop, and Harbor Hacks, the first Baltimore hackathon created by youth for youth. 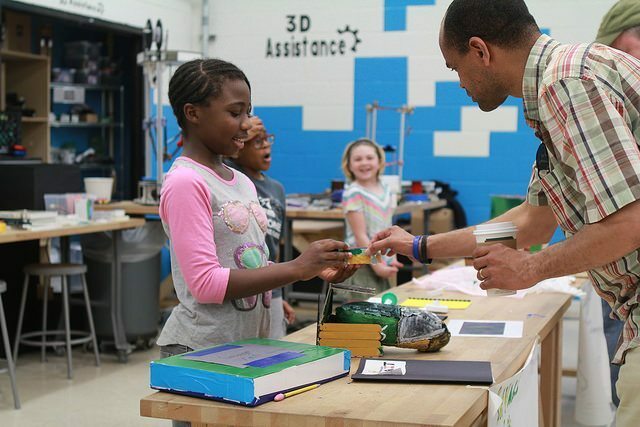 Andrew Coy, DHF’s Executive Director, unveiled the new Expanding Tech Education Initiative, a plan to explore expanding informal tech education for underrepresented communities using makerspaces. The initiative will be funded by a research grant from the National Science Foundation EAGER program. Three sites will be selected to participate in the 18-month pilot program. Each site will receive $25K in new equipment and consumable material for curriculum implementation. The intention of this research is to find ways to create sustainable and diverse makerspaces in communities that could benefit from them. On Thursday, February 1st at 4pm, DHF will host a conference call that will go through the details of the program and the selection process. If you’re interested in learning more information about DHF’s plans and process for the initiative, RSVP for the informational call! 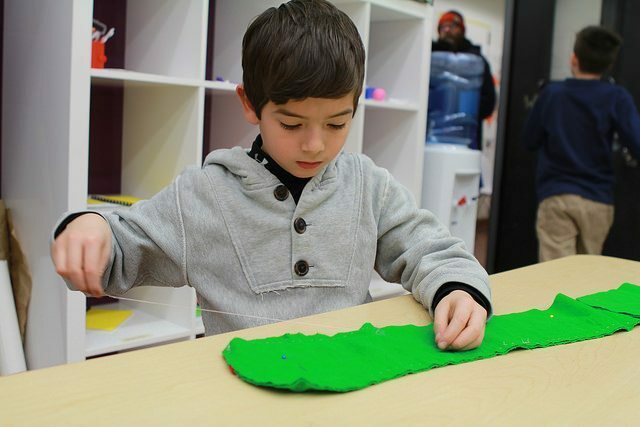 This past winter, we ran a course for our Mini Maker program called Tinkering Toys, which aimed to teach our youngest makers a variety of manufacturing techniques for creating toys. 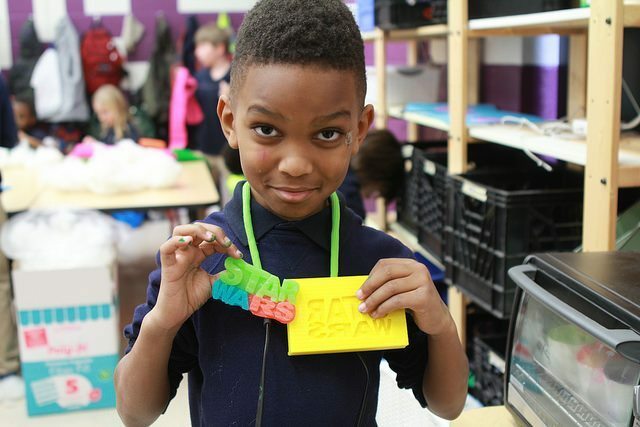 Any chance the Mini Makers have to 3D print they take it, so when they found out that we would be creating toys by not only 3D printing, but by hand and using a laser cutter they were beyond excited! This course covered a variety of topics related to toy manufacturing, from coming up with the design to the different processes for fabrication. 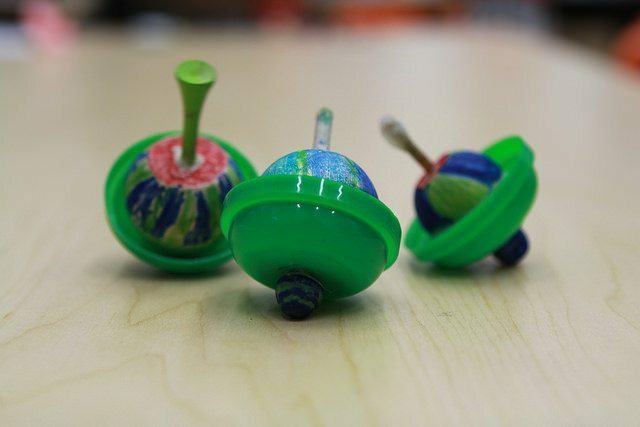 For each project, we worked through the design process and then turned our designs into actual toys using a different technique each time. 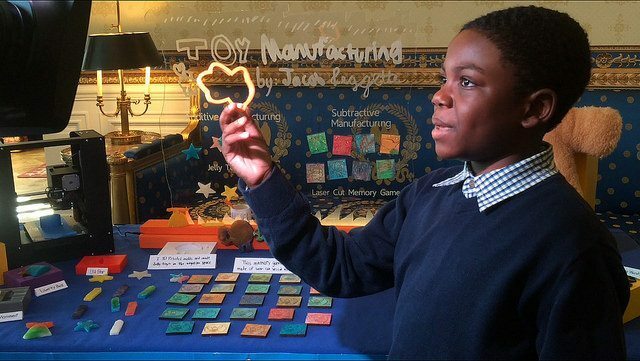 Each Mini Maker started out by designing their own Toy Company. Here we practiced the process of Screen Printing. 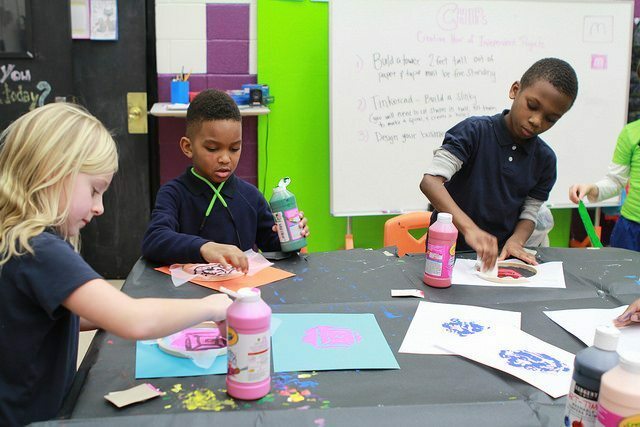 Each Mini Maker created a logo image for their company and screen printed it using embroidery hoops and vinyl cutting. From there we moved on to Mold Making, another process that can be mass produced. Each Mini Maker designed a mold using Tinkercad to be 3D printed and filled with, what we like to call, sticky toy solution. 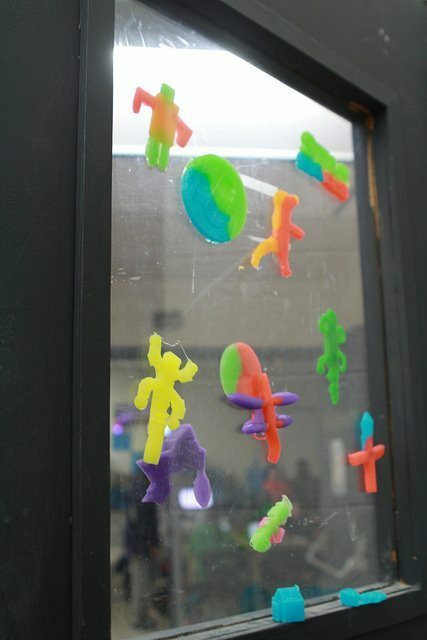 This solution works great for creating window clings and toys like those sticky hands found in quarter machines. 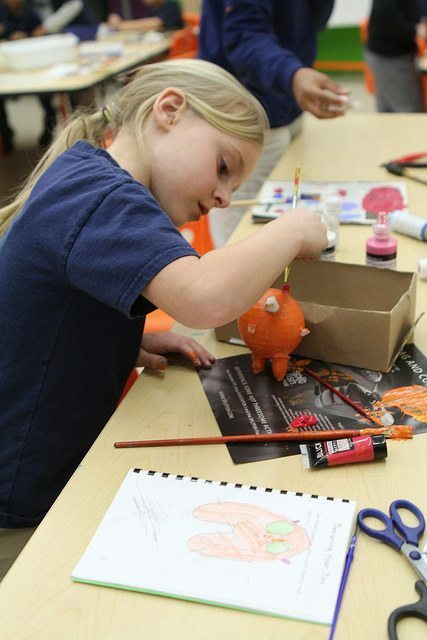 As we created each toy, Mini Makers would go through the design process, come up with how their toy would look, prototype, rework the design, and produce their product. Some toys we produced directly focused on different steps of the design process, whether that was specifically designing their logo, prototyping with their 3D printed parachute toys, or fabrication through sewing or laser cutting, they still had to go through the whole process. At the end of the cycle we had our very own Toy Fair where the Mini Makers pitched their company and ideas to the public. 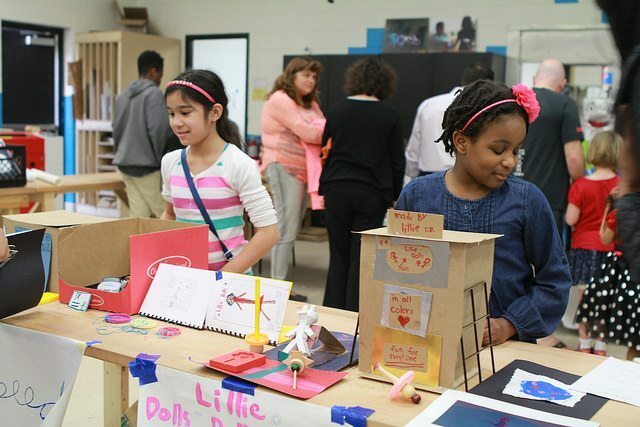 They showcased each of the products they made and talked about the processes used to create each one. 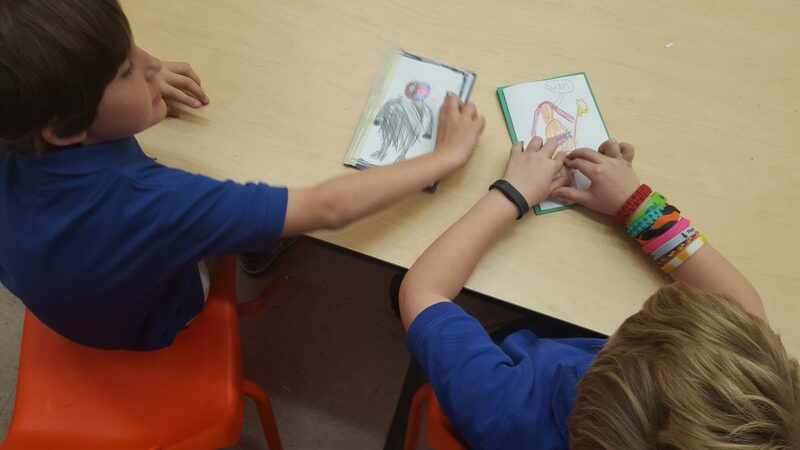 It was so rewarding to see the Mini Makers really grasp the concepts they learned and be able to show off their work confidently. This was an enjoyable course for all our Mini Makers, educators, and staff and definitely something we would like to run again in the future. Yesterday was a big, exciting day for all of us at DHF. 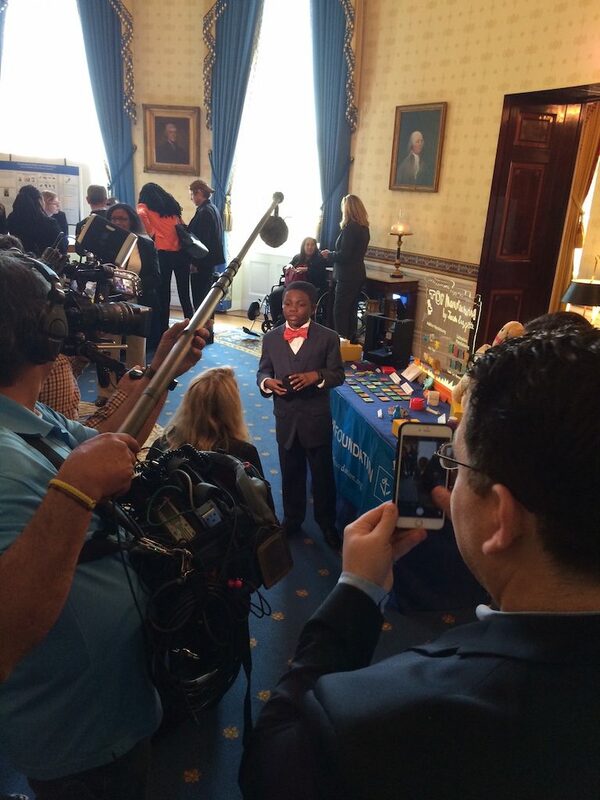 One of our very own Mini Makers, Jacob Leggette, represented DHF at the 6th and final White House Science Fair of President Obama’s administration. This is the second year in a row that we have had one of our youth invited to participate in the WH Science Fair. Last year, you may recall that Sierra Seabrease presented her Digital Jukebox at the same event. We all gathered around the projectors at the Tech Center yesterday afternoon and anxiously watched the live-stream for some footage of our young maker at the White House. 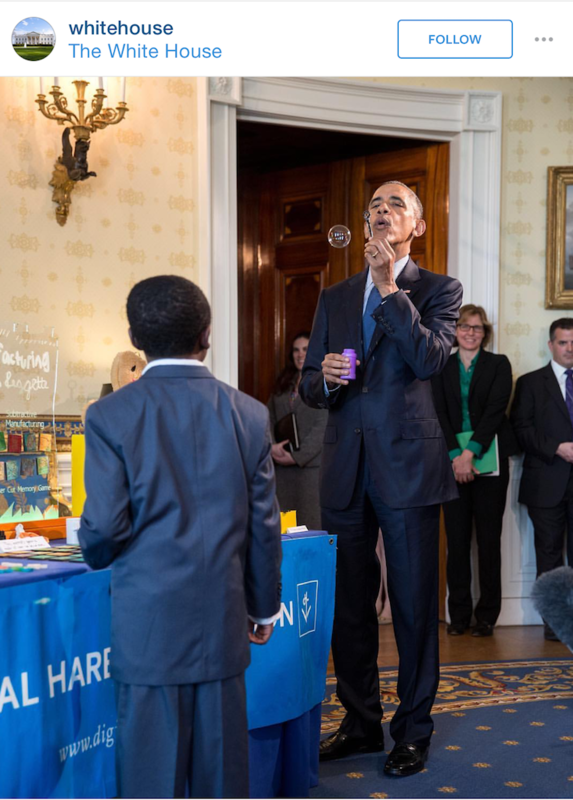 We were all surprised and ecstatic to finally catch a glimpse of him…blowing bubbles with the President himself! Jacob eagerly shared his story about learning to 3D print in our summer Maker Camp last year, and how he enjoyed 3D printing so much he wrote to companies like Printrbot to ask for a 3D printer of his own in exchange for feedback about how kid-friendly their product was. His table was full of products he designed as part of his explorations of manufacturing processes such as 3D printing, laser cutting, sewing, and mold making. He even created specific products to share at this event like his 3D printed White House, as an example of additive manufacturing, and his Liberty Bell 3D printed mold. 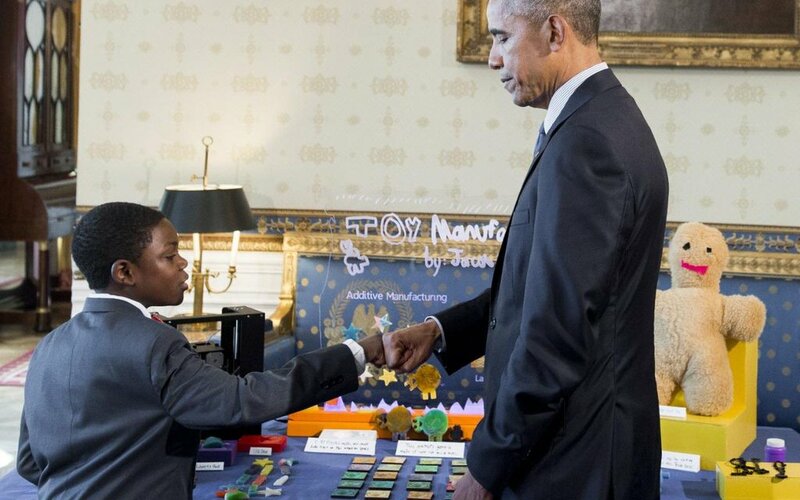 Before ending his conversation with President Obama, Jacob asked him if he has any “child science advisors”, to which the President responded that he did not. Jacob quickly recommended that “You should” and insisted this was a good idea! We are all so very proud of Jacob and what a wonderful job he did representing himself, DHF and Baltimore at this year’s White House Science Fair. We had a fun time with our Mini Makers this fall as we explored circuits and electronics in the Circuit Adventures course! We kicked off the program by exploring objects that contain electrical circuits and identifying what exactly was making them work. On our first day we broke apart thrift store electronics like toys, remotes, phones radio’s etc. Youth had a blast tearing these objects apart and were able to identify some of the main components of the electrical circuits. From there, youth began constructing their first basic circuits in the program. We talked about open and closed circuits and, very importantly, how to avoid a short circuit. Mini Makers also learned what voltage, current, insulators, conductors, and grounds are and why they are important aspects of successful circuits. These simple LED circuits were also a fun way to try out a variety of switches including push/button switches, toggle switches, and flip switches. 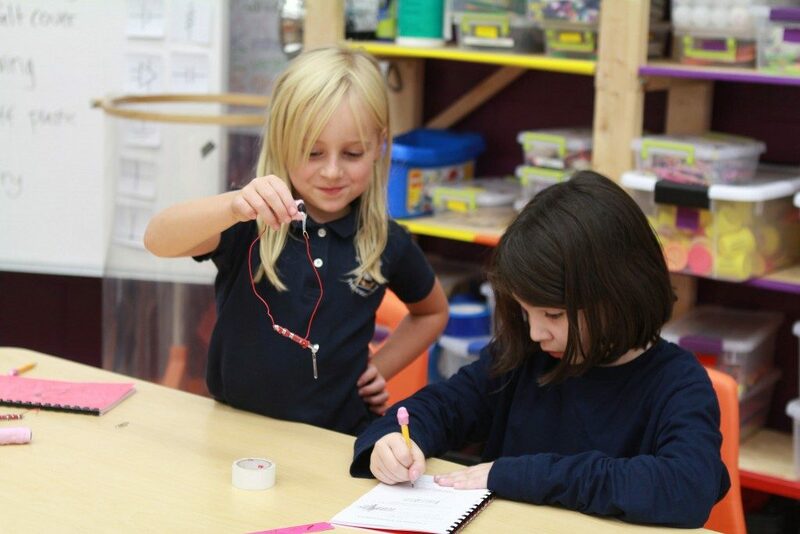 Mini Makers then embarked on an exciting journey into electromagnets and DC motors. 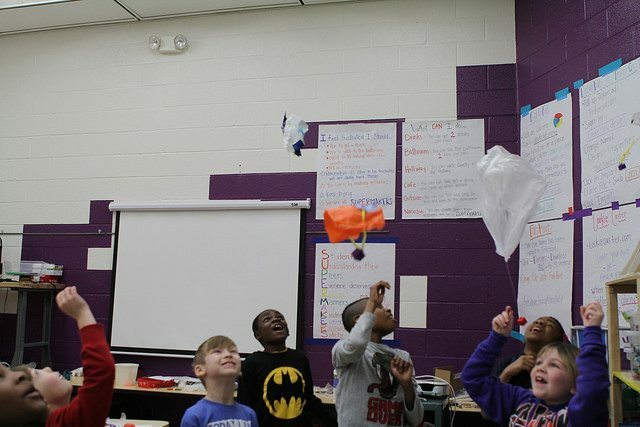 Youth used their new skills to make fishing games using paper clip fish and electromagnet fishing poles, shimmying vibrobots, and personal spin art machines using DC motors. In these units we discussed questions like, “What is the difference between direct current and alternating current?”, “How does an electromagnet work?”, and “What is happening inside a motor to make it run?”. 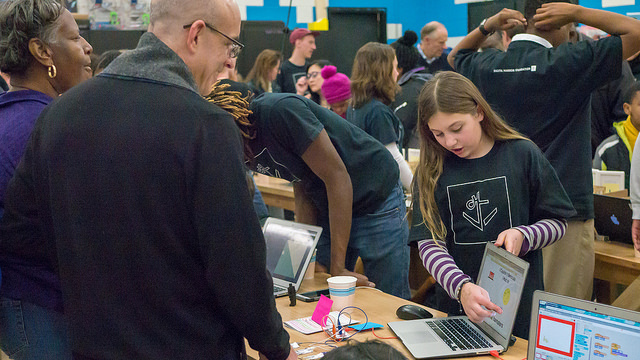 We loved seeing kids get to express their creativity and show of their new electronics skills! Later on in the course, youth had the chance to explore innovative and alternative materials for creating circuits. 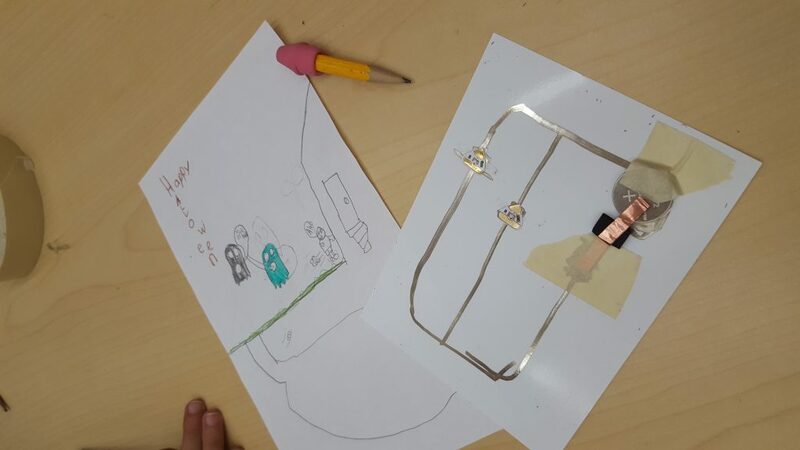 Mini Makers used conductive ink, LED stickers, and copper tape to make cards for various occasions that could light up at the press of a button. Now for the fun part, Makey Makey! 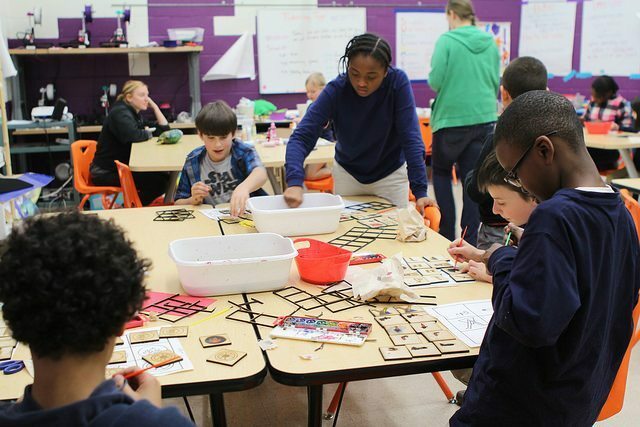 Over several weeks, groups of youth worked together to develop designs for multiplayer boardgames powered by Makey Makey programmable circuit boards. 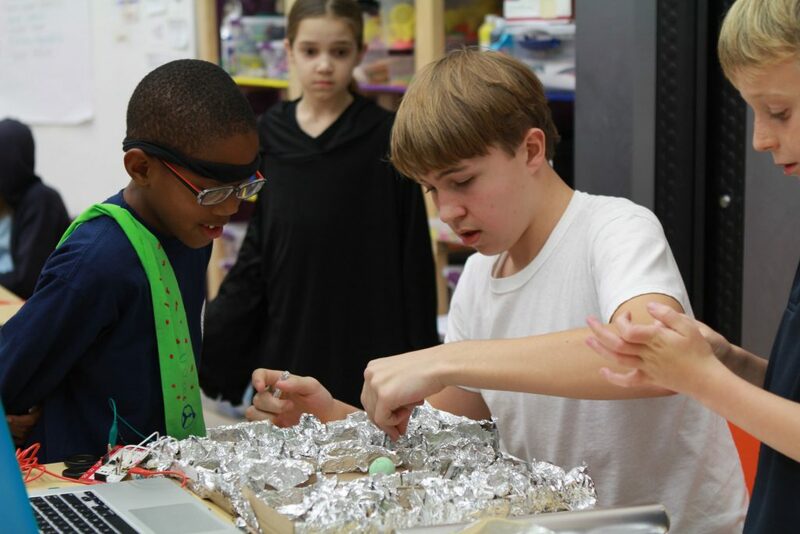 After collaboratively planning out their game on paper, then constructing the components from cardboard and aluminum foil, students programmed the Makey Makey’s to create a “don’t complete the circuit” game. These games were variations on the classic game “Operation”, but with their own unique twist. Once all the games were completed, we invited older DHF youth, staff, and visitors to come play-test the games. 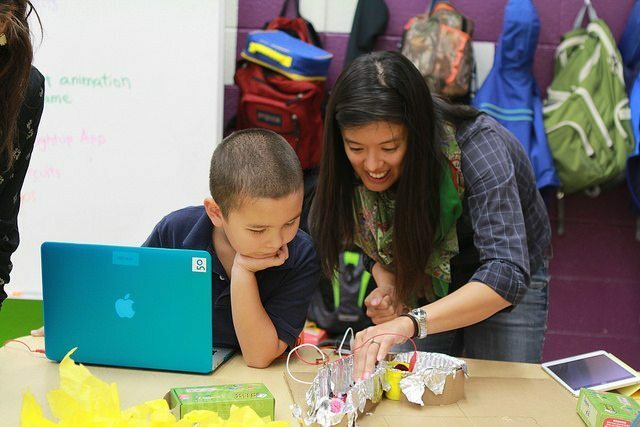 For the final project in Circuit Adventures, youth worked together to create a Circuit City. 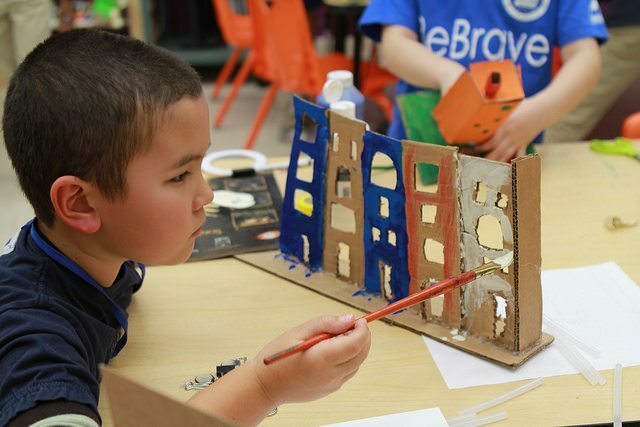 Together, they all planned out what would be included in their city and each individually took responsibility for building different components. Depending on what they were making, students incorporated lights, switches, buzzers, sound, and spinners to bring their cities to life. Overall, this was an exciting course for us to run with our Mini Makers and we look forward to iterating on it and bringing it back in the future!